Catalan wins challenge challenge cup final and Kiran Rai gets the exclusive and holds trophy! 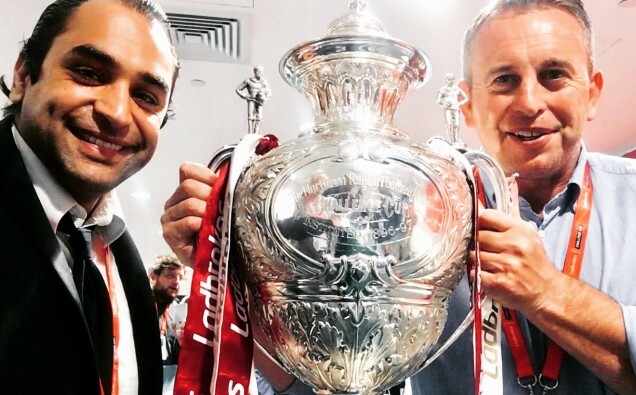 Coach Steve McNamara says Catalans Dragons’ long-term ambitions after winning the Challenge Cup is to one day build a French team capable of winning Super League too and presenter and actor Kiran Rai who talks hosting his 22nd major sport event and managed to interview the players and hold the challenge cup final trophy with legend head coach Steve McNamara! But, after becoming the first non-English side to win the trophy, their first job will be to nurse a few sore heads in Perpignan on Sunday following an “all-night party”. “I knew winning the Challenge Cup might be possible and we now also need to prove that we could one day challenge for a Grand Final. That meant a flight back to the south of France, landing at one o’clock in the morning – and then everyone back to the Stade Gilbert Brutus. “I know just how much money has been spent by the fans trying to get across here. But also there were others back home who could not get across here because of the expense,” the former England coach continued. “They’re working class people who don’t get anything given in life but we want to get back to Perpignan and share this with them. “We’ll probably have to fight to get through the airport and we’re not due in until one o’clock in the morning but then we plan to party all night. Catalans’ historic cup win, in which they also downed Super League leaders St Helens in the semi-final, comes less than a year after narrowly avoiding relegation in the Super League play-offs. Their march from the south of France to Wembley triumph has also been replicated in Super League after a slow start which earned them just two wins from their first 11 games. “I knew before the season started it would be difficult,” said McNamara. “But I didn’t expect it to be as difficult as it was. “But we implemented changes. The players were part of that and, over the second half of the season, we’ve put in some unbelievable performances to secure our Super League status. McNamara was delighted for Dragons owner Bernard Guasch at this culmination of such a major project as making a side from across the English Channel a force in the land where rugby league was created. But McNamara was pretty happy too. A loser as a player at the old Wembley in 1997 with Bradford, his most recent trip to the rebuilt Wembley was in 2013 as England coach when his side were cruelly beaten in the last minute by a converted try from New Zealand’s Shaun Johnson in the semis. Kiran Rai got the exclusive backstage at Moto Grand Prix Silverstone!